These unusual bulbs will give you incredibly vibrant displays this summer. They will produce spikes of cream purple edged flowers topped with a crown of leaves. Despite their exotic good looks, these lilies are totally hardy coming back year after year. Perfect for planting in pots or straight into your garden, they will grow to about 50cm tall. These unusual bulbs will give you incredibly vibrant displays this summer. From June to September they will produce spikes of cream/green flowers, each one with a thin, rich purple edge. Each flower spike is topped with a crown-like tuft of leaves you can see how they got their name! 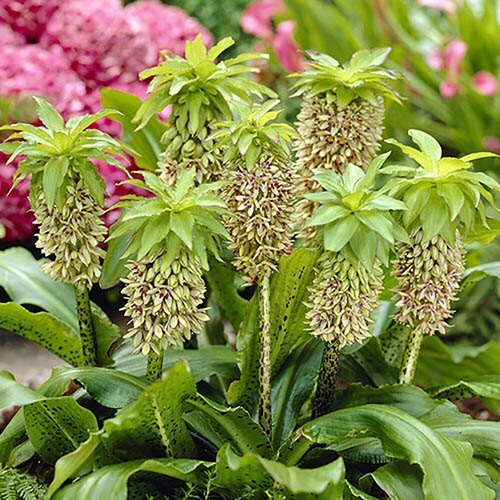 Despite their exotic good looks, Pineapple Lilies are surprisingly hardy and will easily withstand British weather. Perfect for planting in pots or straight into your garden, they will form an attractive rosette of leaves, from which the stem will rapidly grow, reaching around 50cm (20) tall. In autumn, allow the plants to die back naturally, and they will reward you with bigger better displays for many years! Supplied as a pack of 3 bulbs, ready to plant.